Knights hope to be celebrating victory in the B&I Cup final tomorrow. 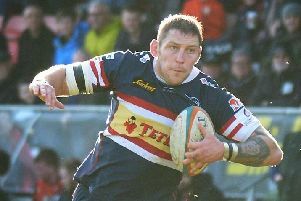 Doncaster Knights have not got much longer to wait for another milestone in the club’s history - their first appearance in a national cup final. Knights face Worcester Warriors tomorrow (5.10pm) in the British & Irish Cup final, on home soil at Castle Park. The game also pits Doncaster’s director of rugby Clive Griffiths against one of his former clubs, Championship high fliers Worcester. Knights qualified from the group stage as top seeds after picking up five try-scoring bonus points from home and away victories against Cornish Pirates, Bedford Blues and Cross Keys, before disposing of Munster A and then Bristol in the knockout phase. They will face a Worcester side who dumped cup holders Leinster A out in the semi-finals and are regarded by most people at Castle Park as the best team outside of the Premiership. Neither club has reached this stage of the competition before, with Doncaster’s previous best a semi-final appearance in 2010. Knights club captain Matt Challinor said: “There were rumours earlier this week that they will play the same sort of team they’ve fielded throughout the competition with several Academy players involved. “But we’ve given them total respect in the build-up this week because whatever team they play we know, given their strength-in-depth, that it will be a strong side. “But once the game kicks-off that is when the respect will finish, as in all our previous B&I Cup games this season.